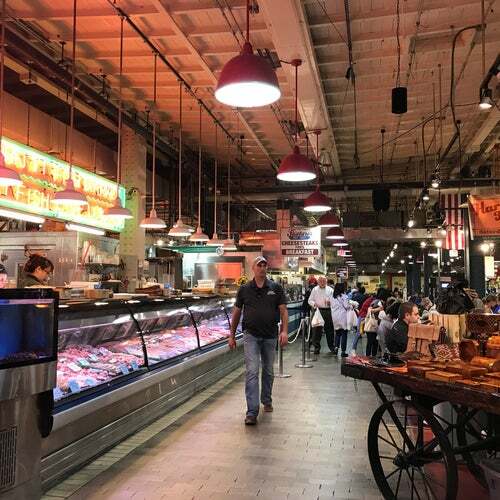 A few blocks from City Hall, and only a short walk from most of the gay bars in Philly, this is a great market to wander with friends, or that guy who woke up in your bed this morning. Plenty to see, smell, and taste. Near: btwn Arch St. & Filbert St. The real crossroads of the city - people from all walks of life and all over the region come here for fresh ingredients from local merchants, including outstanding produce, meat and fish vendors. There are many great places to grab a bite, too. Visit from Wednesday through Saturday especially - you wouldn't want to miss the Amish. very crowded with all sorts of people just about any day of the week apparently...I was there twice during my 4 day visit to the city. One heck of a grocery store with plenty of eateries thrown in. Ate there, and found the food fast and good.